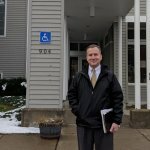 David Turan continues with Tompkins County Chamber of Commerce | DiMarco, Abiusi & Pascarella CPAs, P.C. The firm is proud of David's contributions to the Tompkins County Chamber of Commerce. Shareholder David Turan will continue as Treasurer of the Tompkins County Chamber of Commerce for 2019. David, a current board member, has been associated with the Tompkins Chamber for over three years and also serves as Chair of the Administration & Finance Committee, Executive Committee Member & Trustee of the Tompkins Chamber Foundation.